A busy first week of November for Bield was matched by great coverage across the Scottish press thanks to multi-award winning PR agency Holyrood PR. Appeals for volunteers, ranging from ‘Befrienders’ to ‘Silver Surfer Tutors’ was recognised by industry and regional titles spanning the width of the country. Volunteers play a vital role in Bield’s operations so it is critical that their requests make as big an impact as possible. Here at Holyrood, we are privileged to play a part in uniting kind-hearted members of the community with the tenants at one of Scotland’s leading care and housing providers. Exposing the story to a readership of well over 34,000 at regional level we were able to guarantee that the appeal was seen where it was needed most in trusted local publications. Appearing in respected capital papers the Edinburgh Evening News, with potential audiences of 23,000, and The Edinburgh Reporter‘s online edition, reporting to thousands more, the story was viewed by the heart of the communities that would be able to help Bield’s Gordon Court development in Leith. Fauldhouse, Armadale and Livingston which host Bield developments were well serviced by the West Lothian Courier whose paper reaches upwards of 11,000, and will benefit as a result. The essential industry care press would cap off this great coverage in Housing Scotland Today and Scottish Housing News which made readers aware of the need for volunteers in Gorebridge. 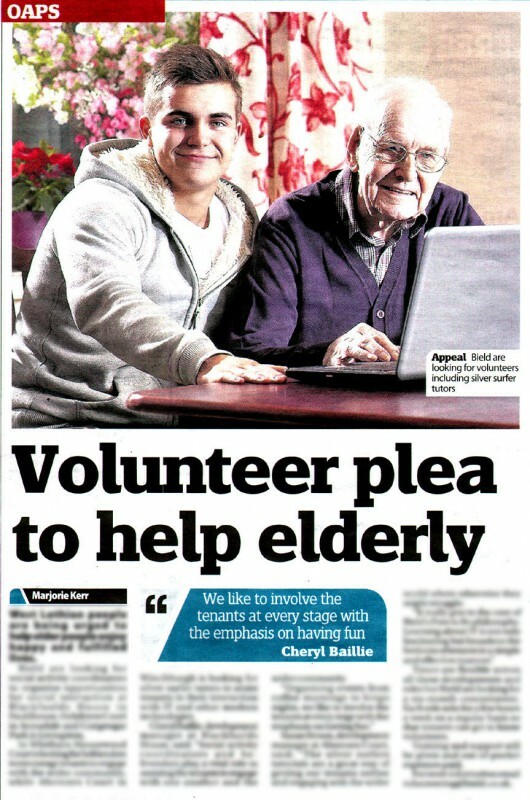 In addition to these appeals, Bield also received further online coverage for their long service awards which reached thousands online on the Falkirk Herald and helped to spread the word of the fantastic achievements made by Bield and it’s staff on a regular basis. All this positive publicity for Bield was part of their ongoing work with Holyrood PR as they promote their care and housing services. Can Holyrood PR take care of your PR?